People Before Profit TD Bríd Smith has called on the parties in the Dáil to support her Petroleum and Other Minerals Development (Amendment) (Climate Emergency Measures) Bill 2018 as it goes to committee stage this Tuesday. 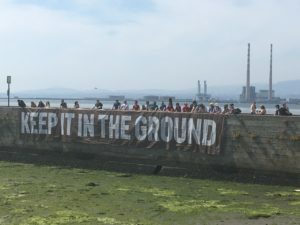 The TD was speaking at a ‘Keep it in the Ground’ banner drop at the Wooden Bridge on Bull Island. People Before Profit we joined by climate campaigners Not Here, Not Anywhere and Stop Climate Chaos at the unveiling of the banner. The Bill would categorize the levels of Co2 in the atmosphere as an emergency and stop the government from issuing any new licences for the exploration of fossil fuels. Costa Rica, Belize and France have already implemented similar measures. Brid Smith said: “The science is quite clear on the fact that to avoid a massive climate disaster we need to keep 80% of know fossil fuel reserves in the ground. This bill would do that. “Leo Varadkar called Ireland a laggard regarding action on climate change. With this bill we have an opportunity to take the lead on a global level with countries like France, Costa Rica and Belize who have already introduced similar measures. “The Dáil committee will begin detailed scrutiny of my Climate Emergency Measures Bill on Tuesday next.